With so many different types of salt available today, it can be confusing. How do you know which one is best? What are the fleur de sel and sea salt benefits? 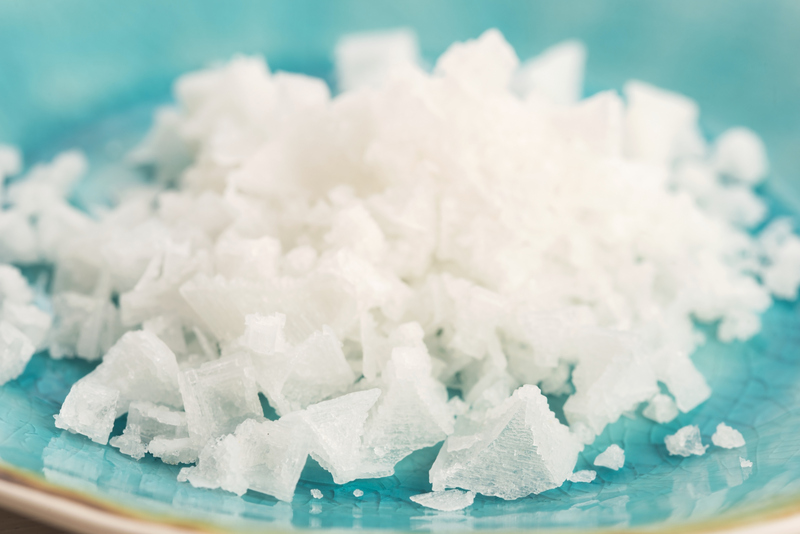 Here’s a quick overview of the difference between fleur de sel, sea salt, and regular salt. Fleur de sel and sea salt are both derived from seawater. 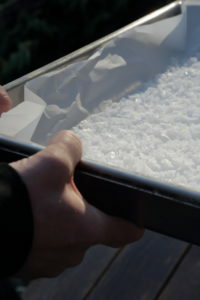 Fleur de sel are the distinctive pyramid-shaped crystals that rise to the top during the evaporation process. Like a delicate flower they bloom and float on the surface and must be gently harvested by hand. Crystals are very difficult to achieve. A unique set of oceanic and environmental conditions must align for them to form. Sea salt is what’s left after evaporating all the seawater. It is a grain, not a crystal, and contains traces of sediment that give it a slightly bitter taste. Regular or table salt does not come from the sea at all. It is a refined product made by injecting water into an underground salt deposit to form a brine, which is then heated to evaporate the water. Salt Spring Sea Salt is made with the finest hand-harvested fleur de sel crystals and infused with locally sourced ingredients. You will see, taste and appreciate the difference. Here’s why. Purity – Fleur de sel is the purest form of salt you can get. It contains absolutely no gypsum or other impurities from the sea. Taste – Because it is so pure, there’s no bitterness. It melts slowly on the tongue and provides a delicious crunch as it enhances the flavour of the food. Chefs worldwide consider it to be the crème de la crème of salts. 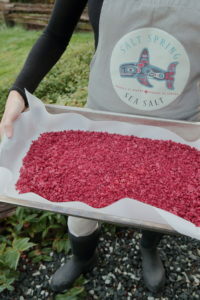 Variety – Our flavour-infused sea salt using local organic herbs, fruit, spices, wine and beer are truly unique. You won’t find anything like them in the world. Beauty – You first eat with your eyes. Our flavour-infused crystals come in an array of colours that visually tempt the taste buds when sprinkled randomly on top of food. Health – Fleur de sel is as natural as you can get. Once you use start using it as a finishing salt, and taste the difference it makes, you won’t ever want to cook with regular salt again. This will reduce your overall salt intake. Fleur de sel is a finishing salt that enhances the taste of soups, salads, fish, meat, fruit, vegetables, even dessert. 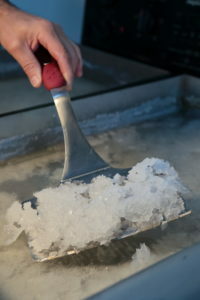 It is important to only use it on food just before serving, and not while cooking as high temperatures will cause the crystals to melt and lose their unique character. There is an art to sprinkling fleur de sel on your food. Take a three-finger pinch, then in one circular motion high above the plate crush the crystals between your fingertips letting them fall randomly to create a rollercoaster of taste with every bite. Keep a variety of the natural and flavoured sea salts in small ceramic or glass bowls on the table or kitchen countertop and refill as needed. The colourful array of crystals are beautiful to behold and enrich the dining experience.